i love your sneakers, i'm in love! Thanks! Francisca, by clicking this link http://www.mirroroffashion.com/2011/04/new-in-nike-flash-macro-sneakers.html you'll find out where to buy them online. I like your top, the detailing on the shoulders is cute! echt een leuke broek! en de veters zijn ook leuk haha. I love this look, especially your MMM top. You are so effortlessly chic. glad to have stumbled across your well-round + fashionable blog! Super!!! J aime ton look!!! What a great look - so colorful! 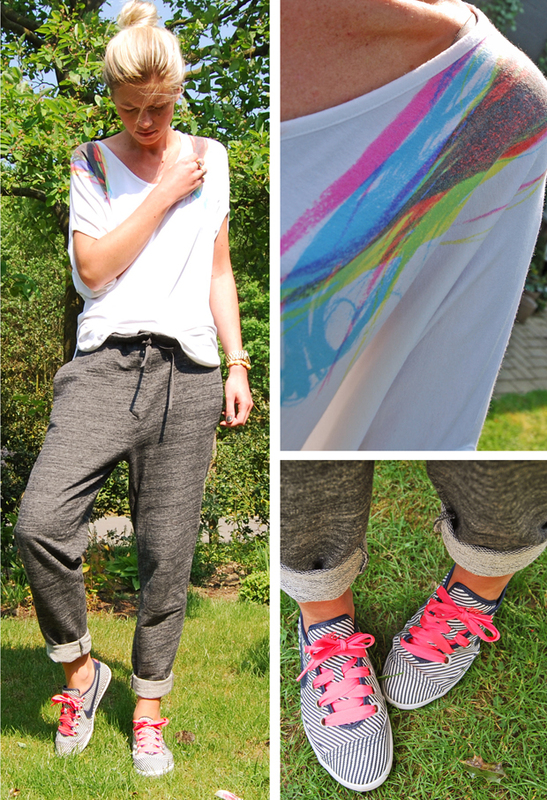 Wat een prachtige outfit, love the sweatpants! Very cute outfit, love the top! you look so comfy, but still gorgeous! Those shoes are so chic! Love the outfit too!! That top and pants are so cute! oh lord. this is the greatest outfit i've seen in a while. love. i heart your comment, and a new post is up! i love this casual style!great look lady:)your blog is soo nice!! Would you come and follow mine if u like it?i'll do the same back..i'd be happy to follow each other..i wait u..kiss from Milan! You are all so fabulous! As for the following and following back, sorry guys but I don't do that. Hello! Thank you so much for the comment! Just wanted to let you know that your style is amazing! I'm now following, and can't wait to see more outfits! The color and model of the pants are amazing, love the shirt as well. Great look! ahaa, I liked that "hot nerd"! i really love your shoes, amazing look!! wow your blog is great!!! love these pants. love the entire outfit! I'm really really happy to follow you and thanks for the sweet comment on my blog! come back to visit me and follow me back if u want. And the outfit seems so comfortable!! p.s. follow you! hope you follow me too! edit: outfit of the day: coolest sweatpants ever!!! haha seriously, i really love them, and they look so great on you. pretty pictures! How Cool, effortless and modern outfit! Loving the colors and the way you put everything together. This outfit looks so comfortable but really chic at the same time! This seems like it would be perfect to go shopping in! It looks amazing on you! simply yet chic! love the colors. Those pants are so cute and they look incredibly comfortable.